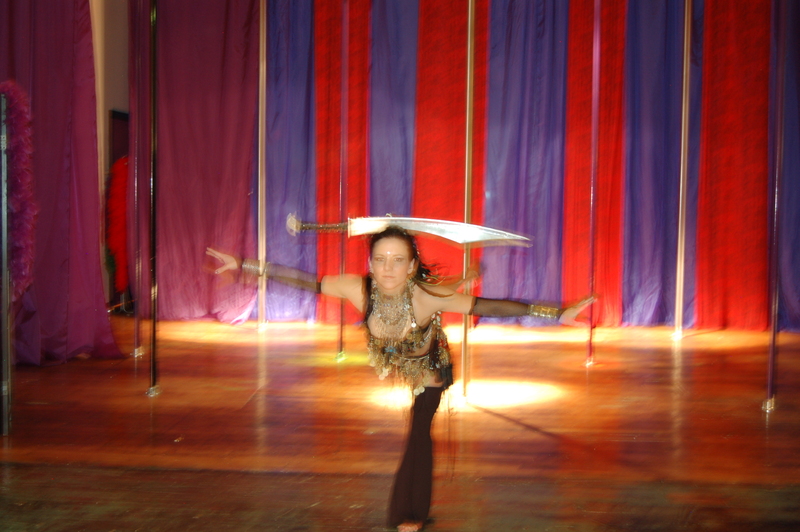 Belly dancing with a sword makes you feel powerful. Belly dancing arose from various dancing styles which were performed in the Middle East and North Africa. One theory is that belly dance may have roots in the ancient Arab tribal religions as a dance to the goddess of fertility . A third theory is that belly dance was always danced as entertainment, some believe that the movements of dancing girls depicted in carvings from Pharaonic times are typical of belly dancing. As the term belly dance has come to refer to a wide variety of dance practices, predominantly performed by independent female dancers, it is very difficult for any single claim to be upheld. Another theory is that belly dance was originally danced by women for women in the Levant, and North Africa. The book “Dancer of Shamahka” is widely cited; it is a romanticizedmemoir written by a modern author, Armen Ohanian, published in 1918. In Middle Eastern society two specific belly dance movements have been used in childbirth for generations. Because belly dance derives from individual performance, it has a diverse history of origin, and continues to evolve to this day. Some[who?] suggest that belly dance shares origins from migrating peoples from all around the borders of the Mediterranean, resulting in the similarities that can be seen between ‘belly dance’ as found in North Africa and Middle East. Belly dance was popularized in the West during the Romantic movement of the 18th and 19th centuries, when Orientalist artists depicted romanticized images of harem life in theOttoman Empire. Around this time, dancers from Middle Eastern countries began to perform at various World’s Fairs, often drawing crowds in numbers that rivaled those for the science and technology exhibits. It was during this period that the term “oriental” or “eastern” dancing is first used. Several dancers, including the French author Colette, engaged in “oriental” dancing, sometimes passing off their own interpretations as authentic. Also the pseudo-Javanese dancer Mata Hari, convicted in 1917 by the French for being a German spy, danced in a style similar to what is known as belly dance. Egyptian forms of belly dance, alongside the development of Egyptian music, were heavily influenced by the presence of European colonial forces, and increasing urbanisation in Egypt. This resulted in variations in the dance brought in by influences as diverse as marching bands, and visits of the Russian ballet. Many of the aspects recognisable as belly dance today in fact derive from these cross-cultural hybrids. Any or all of these factors may have contributed to the development of belly dance as we know it today. In the West, the costume most associated with belly dance is the bedlah (Arabic for “suit”). It owes its creation to the Victorian painters of “Orientalism” and the harem fantasy productions of vaudeville, burlesque, andHollywood during the turn of the last century, rather than to authentic Middle Eastern dress. The bedlah style includes a fitted top or bra (usually with a fringe of beads or coins), a fitted hip belt (again with a fringe of beads or coins), and a skirt or harem pants. The bra and belt may be richly decorated with beads, sequins, braid and embroidery. The belt may be a separate piece, or sewn into a skirt. Badia Masabni, a Cairo cabaret owner, is credited with bringing the costume to Egypt, because it was the image that Western tourists wanted. The hip belt is a broad piece of fabric worn low on the hips. It may have straight edge, or may be curved or angled. The bra usually matches the belt and does not resemble lingerie. The classic harem pants are full and gathered at the ankle, but there are many variations. Sometimes pants and a sheer skirt are worn together. Skirts may be flowing creations made of multiple layers of one color sheer fabric chiffon. Oriental-style American dancers often purchase their costumes from Egypt or Turkey, but hallmarks of the classical “American” style include a headband with fringe, sheer harem pants or skirt rather than tight lycra, and the use of coins and metalwork to decorate the bra. For the folkloric and baladi dances, a full-length beledi dress or galabeyah is worn, with or without cutouts. American Tribal style dancers often make their own costumes or arrange to have them custom-made, as personality and originality are an important part of the costuming. This style of costume tends to involve large pants covered with one or more skirts and belts. The top is usually a coin bra with pieces hanging from it, and dancers wear flowers, headbands, metal headdresses, and other folkoric-inspired pieces in their hair. They also often wear bindis and sport large tattoos that travel around the hip and belly area. Most of the movements in belly dancing involve isolating different parts of the body (hips, shoulders, chest, stomach etc. ), which appear similar to the isolations used in jazz ballet, but are often driven differently. In much of bellydance there is a focus upon the core muscles of the body producing the movement rather than the external muscles of the body. Egyptian and Lebanese bellydance in particular emphasise the need for movemements to originate in the muscles of the back. Correct posture is as important in bellydance as it is in other fields of dance. In most belly dance styles, the focus is on the hip and pelvic area. Due to the diversity of styles and ‘origins’ of the dance, many of the moves are referred to by a wide variety of different terminologies. However, from an observer’s point of view bellydance includes certain key elements. Shiver or Shimmy – a shimmering vibration of the hips. This vibration is usually layered onto other movements to create depth in performance. It may be created by moving the knees past each other at high speed, although some dancers use contractions of the glutes or thighs instead. It is also possible to perform this using the muscles of the lower back. The two terms may refer to performing this move in different directions, as it is possible to create this vibration moving the hips alternately up and down, side-to-side, or in a forward and back swinging motion. The same move can be performed using the shoulders and is sometimes called a shoulder shimmy. Hip hits – A staccato movement of the hips out from the body. This can also be performed using other body parts such as the shoulders or chest. The move is usually performed by a quick shifting of the weight from one leg to the other and creates the impression of a swinging pelvis. Undulations – Fluid movements of the hips or of the chest in a circular or rotating fashion. There are a wide variety of movements of this kind, of which the most well known is probably the rotating movements of the chest forward, up, back and down to create the impression of riding a camel. Different styles also incorporate kicks and arm movements as an integral part of the style. Belly dance is a non-impact, weight-bearing exercise and is thus suitable for all ages, and is a good exercise for the prevention of osteoporosis in older people. Many of the moves involve isolations, which improves flexibility of the torso. Dancing with the veil can help build strength in the upper-body, arm and shoulders. Playing the zills trains fingers to work independently and builds strength. The legs and long muscles of the back are strengthened by hip movements. Paffrath also researched the effect of belly dance on women with menstruation problems. The subjects reported a more positive approach toward their menstruation, sexuality, and bodies.